Spontaneous alternation. This Y maze is used to assess (without food deprivation or other aversive procedures) the normal navigation behaviors of rodents. Test subjects are placed in a Y-shaped maze for 5 to 8 min. All arm entries are sequentially scored so that the total number of arm entries, as well as the sequence of entries, are recorded. Data are analyzed to determine the number of arm entries without repetition. Success in this test is indicated by a high rate of alternation in the control groups indicating that the animals can remember which arm was entered last. Two-trial recognition memory test. Another use of the Y-maze is the recognition memory test. With one arm of the Y maze blocked, the subject is placed in one of the arms and is allowed to explore the 2 arms for 15 minutes. The subject is returned to the maze 1-4 hours later with all arms open and is scored for 5 minutes. The first arm entered, the amount of time spent in each arm, and the number of entries into each arm is recorded. Seven to ten days later the test is repeated with a delay time of only 2 minutes between the trials. Each of the Y-maze tests has been shown to be sensitive to hippocampal damage, gene manipulations, and amnestic drugs. 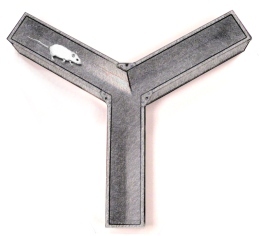 The Y-maze test is particularly useful as an initial test of memory function in mice.